Where P is the currently tested parameter set, is a point in the dataset, and the corresponding simulated value. The indices i and j denote rows and columns in the dataset. The weight for each data column is given by . COPASI provides 3 methods shown in the table below to calculate the weights for you. After applying the method chosen COPASI scales the weights so that for each experiment the maximal occurring weight is 1. In case that the weights calculated are not satisfactory you are able to manually override them individually. To specify the experimental data you click on the Experimental Data button at the top right of the parameter estimation dialog. A new dialog opens that lets you enter experimental data. Values in columns marked ignored are not taken into account during parameter fitting. Columns of this type may not be associated with elements of the model. Independent data is data which needs to be set for the correct simulation of the experiment row. Possible model elements are initial concentrations or kinetic parameters. Note, for a time course experiment only the independent data in the first data row is set before the start of the simulation. Columns of this type must be associated with elements of the model. The dependent data is the data, which COPASI tries to fit by minimizing the sum of squares between the simulated data and the experimental data. Columns of this type must be associated with elements of the model. This column type is only available for time course experiments. Obviously only one column with this data type may exist. COPASI attempts to automatically identify the column containing the time by looking at the column headers. You may correct COPASI's guess. This column may not be mapped to any model elements. The last column in each of the lines contains the weight for the specific data set. If it is calculated by COPASI (using one of the modes mentioned above) it is surrounded by brackets. If you want to change this value you have to remove the brackets and enter a different value. If you want to go back to automatically calculated values you can delete the content of the box completely and COPASI will return to automatically calculating the weight. If you don't want COPASI to use the whole dataset of an experiment, but only a subset, you can specify the start and end line for this subset. You also may delete experiments completely. If you do so, you may notice that the New Document will be enabled. Pressing it will add the first not used experiment of the currently active file. Since it is commonly the case that all experimental data within one file has the same format, COPASI allows you to copy information of experimental data from the previous to the current or form the current to the next experiment within a file by selecting from previous and to next. 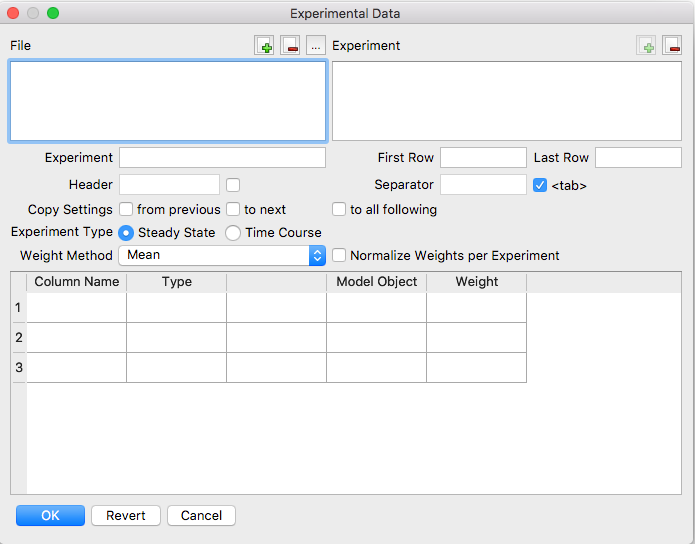 If COPASI detects that experimental data descriptions are identical it will automatically set the from previous check box and disable editing the current experiment. Should you want to modify it you will have to unmark the check box first. If you have more than one file, you can load additional data files and process them in the same manner. Once you are finished defining your datasets for the fitting, you close the data dialog with the OK button. Before you can start the parameter estimation process, you have to choose the method by which the fitting will be done and maybe set some method parameters. Most of the time, the default parameter values should do. The method choosing is done at the bottom of the dialog by selecting the method from the drop down list. For an explanation of the individual methods, please consult the methods section.